Air Serbia’s recent rebranding from Jat Airways is the beginning of a number of significant developments for the airline which will also lead to changes in the Serbian aviation market. Through its partnership with Etihad Airways, Air Serbia will be establishing a medium sized hub in Belgrade with a restructured network featuring 12 new destinations and a new fleet of A319 aircraft. Through this hub other airlines within the Etihad’s ‘equity alliance’ will be able to take advantage of an increased presence in the Eastern European region. Etihad and the Serbian Government agreed to both inject USD40 million into the airline while both parties will each provide up to USD60 million in further funding. Debt from Jat Airways was also written off by the Serbian Government which will allow Air Serbia to launch from a clean sheet. Etihad's EUR40 million loan facility will be converted into equity on 01-Jan-2014. The agreement also included plans for Air Serbia to codeshare with Etihad and airberlin, which is one of five other carriers in Etihad’s equity alliance. The agreement with Air Serbia is Etihad Airways' sixth equity arrangement, following those with Aer Lingus, airberlin, Jet Airways (pending), Air Seychelles and Virgin Australia. Etihad’s strategy of building its own alliance began after 2007 when the global alliances told the airline they weren’t interested in having Etihad as a member. At CAPA’s Australia Pacific Aviation Summit in Aug-2013 Etihad Airways CEO James Hogan said the carrier’s alliance strategy is about creating scale and network and is also about lowering costs by establishing economy of scale and joint purchasing. Mr Hogan’s mandate from Abu Dhabi is to build up scale, efficiency and be best in class but not the biggest. "It's about working smarter," he said. The partnerships have also helped Etihad become profitable. Etihad reported a net profit of USD42 million for 2012, a 200% year-on-year increase, and is on track for another profit in 2013. Mr Hogan told the Summit that in 2Q2013 “we certainly hit all our numbers”. Etihad reported 2Q2013 passenger revenue of USD921 million, up 8% year-on-year. 1H2013 passenger revenue growth was even stronger, up 13% year-on-year to USD1.8 billion. Overall, total revenue (including cargo) grew to USD2.5 billion for the first six months of 2013, an increase of 14%. Of this, Etihad's partnership revenue comprised 20% of total passenger revenue in both periods. Etihad describes the alliance as the world’s first ‘airline equity alliance’ which offers benefits such as streamlining entry into new markets within foreign investment limits, enabling rapid expansion via established brands and offering stronger customer proposition. The alliance also offers lower costs and higher productivity while also offering more choice to passengers. Etihad Airways says the alliance now cover over 410 unique destinations, carrying over 96 million passengers per annum on a fleet of over 500 aircraft. Mr Hogan also said all the equity carriers Etihad Airways had invested in were profitable in 2012 and Etihad Airways recouped its investment in airberlin in the first eight months of the relationship and its partnership continues to enhance revenue and provide cost synergies. Mr Hogan said the airline plans to integrate Air Serbia’s network and trim its workforce while also modernising its fleet, replacing older aircraft with new A319s. The overall aim for Air Serbia is to transform its operations and turn Belgrade into a European hub. Under the partnership Etihad Airways will take over Air Serbia’s administration, revenue management and training (which will move to Abu Dhabi). There will be opportunities for both carriers through network linkage and resource sharing. Mr Hogan said the Air Serbia strategy is essentially the Air Seychelles strategy. Air Seychelles turned a profit of USD1 million in 2012 compared to a loss of USD25 million in 2011. As this formula worked for Air Seychelles, Etihad is confident it can also work for Air Serbia. Under its partnership with Etihad Airways, Air Serbia will expand its network with 12 new destinations while also modernising its fleet with 10 A319 aircraft initially. The airline plans to take delivery of its first A319 aircraft on 27-Oct-2013. Initially two A319s will be leased from Etihad and the airline also has eight new A319s on order for delivery between 2013 and 2016 (one scheduled for delivery in 2013, one in 2014, four in 2015 and two in 2016). These aircraft will replace the airline’s ageing fleet of 10 Boeing 737-300 aircraft. Air Serbia also currently operates six ATR 72-200 aircraft on its regional network. These have not yet been marked for replacement although reportedly could be replaced in 2014 with Bombardier turboprops. As Air Serbia’s initial fleet plan does not provide for expansion, just replacement, the airline will likely review its existing network and could cut or reduce capacity on routes not performing well in order to be able to operate its planned 12 new routes. The airline’s overall capacity is likely to increase slightly as its Boeing 737-300 aircraft are configured with 127 seats in a single-class configuration while A319 aircraft are able to be configured with 138 to 156 seats. Air Serbia currently serves 32 destinations, 31 of which are within Europe and one to North Africa (Monastir in Morocco). With Air Serbia’s planned network expansion with 12 new routes from winter 2013/2014, the airline’s North Africa and Middle East networks will see considerable expansion along with new European routes. Five of the new routes have planned launch dates while the launch of the remaining seven routes hinges on the delivery of additional A319s. The initial five new routes for Air Serbia are Abu Dhabi, Banja Luka in Bosnia Herzegovina, Prague in the Czech Republic, Bucharest in Romania and Ljubljana in Slovenia. The seven subsequent routes that are planned but don’t yet have launch dates are Beirut in Lebanon, Cairo in Egypt, Kiev in the Ukraine, Sofia and Varna in Bulgaria and Warsaw in Poland. BEG = Belgrade Nikola Tesla Airport; AUH = Abu Dhabi International Airport; BNX = Banja Luka International Airport; PRG = Prague Václav Havel Airport; OTP = Bucharest Otopeni International Airport; LJU = Ljubljana Joze Pucnik Airport; BUD = Budapest Ferenc Liszt International Airport; BEY = Beirut International Airport; CAI = Cairo International Airport; KBP = Kiev Boryspil International Airport; SOF = Sofia Airport; VAR = Varna Airport; WAW = Warsaw Frederic Chopin Airport. Of Air Serbia’s 12 planned new routes, four are currently operated by other carriers, though Air Serbia codeshares on Etihad Airways’ daily Belgrade-Abu Dhabi service which is also operated with A319s. The eight destinations not currently served with a direct link from Serbia will see Serbia’s international links grow, particularly to Eastern Europe and also to North Africa and the Middle East. Serbia’s existing international capacity of about 100,000 seats per week also stands to increase as Air Serbia expands its network. Aside from Belgrade-Abu Dhabi service, of the 12 new destinations for Air Serbia, Etihad Airways currently only operates to Beirut and Cairo. The remaining nine destinations are new to Etihad Airways and therefore will represent a considerable extension of Etihad’s reach into Eastern Europe. Air Serbia is already the largest of the flag carriers based in the EX-YU region and offers more capacity within the region than any other carrier. This will expand further with the announced network expansion. Etihad will particularly be able to leverage the carrier’s strong network in the EX-YU region. Podgorica and Tivat in Montenegro are Air Serbia’s largest routes and are currently served with three daily flights, according to Innovata data. Skopje in Macedonia is served with nine weekly flights and Sarajevo in Bosnia and Herzegovina once daily. A second destination in Macedonia, Ohrid, is served with four weekly flights. Air Serbia also flies to three Croatian cities – Dubrovnik, Pula and Split – with four to five weekly flights to each destination. Several of these destinations could see capacity increases as they are not served by Etihad and traffic will likely increase as Belgrade evolves into a regional hub for Etihad. While direct services to Western Europe will probably be maintained (Paris, Zurich, London Heathrow, Frankfurt, Dusseldorf and Amsterdam are all among Air Serbia top 10 routes), Air Serbia’s growth under Etihad management will more likely be focused on regional services. The feed from Etihad should allow Air Serbia to expand in the Eastern European markets, giving it an important competitive advantage over other carriers from the region. 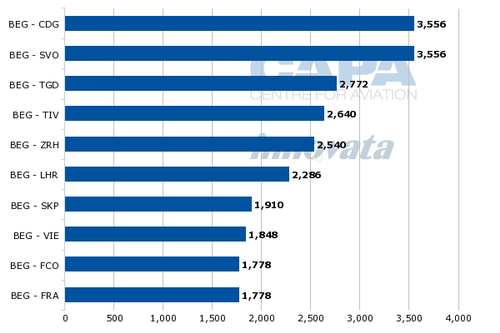 Currently about one third of Air Serbia’s seat capacity is allocated to other EX-YU countries. Etihad’s online network currently does not include any destinations in Montenegro, Macedonia, Bosnia and Herzegovina or Croatia. The UAE flag carrier will be able to use Air Serbia to increase its presence significantly in the EX-YU region and offer connections via Abu Dhabi to destinations throughout the Middle East, Africa and Asia-Pacific. Compared to other key European carriers, Air Serbia will operate a significant Eastern European network, particularly in the EX-YU region. While the large European airline groups have bigger Eastern European and Russian/CIS networks than Air Serbia, for Air Serbia’s size it has a considerable Eastern market presence, which will significantly increase following its upcoming route expansion. Air Serbia also has the advantage of operating a considerable Western European network which can feed passengers onto its Eastern European network, which features a number of routes unique to Air Serbia compared to the above airline groups (such as to Podgorica in Montenegro). The other European members of the Etihad equity alliance, Aer Lingus and airberlin, have extensive Western European networks but do not have such a large presence in the Eastern Europe region. Aer Lingus currently has four Eastern European destinations while airberlin has 10. Air Serbia’s entry into the alliance will see their reach into the region greatly improve, through codeshare arrangements. Through Air Serbia’s codeshare arrangements with Etihad Airways and other airlines in the equity alliance, passengers from these other carriers will also be able to be fed into Air Serbia’s Eastern network. Air Serbia’s Eastern European network will likely continue to grow with support from Etihad Airways and other members of the Etihad equity alliance. As Serbia’s national carrier and sole scheduled airline, Air Serbia plays an important role in providing international air transportation to Serbian citizens. Serbia’s scheduled air transport market is purely international and operates mainly from the capital’s Belgrade Nikola Tesla Airport in northern Serbia and from Nis Konstantin Veliki Airport in southern Serbia. 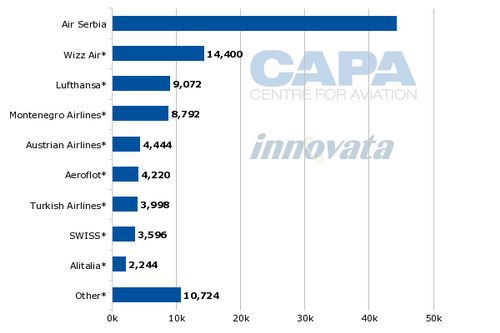 Air Serbia is currently the largest airline with almost 45,000 seats offered, representing about 42% of Serbia’s overall available capacity for the week commencing 9-Sep-2013. Air Serbia is followed by Wizz Air with around 13% of capacity and by Lufthansa and Montenegro Airlines, which each provide around 8% of capacity. Air Serbia’s network is currently focused on Europe with only one route (Belgrade-Monastir) to North Africa. However following signing its partnership with Etihad Airways, three of its 12 planned new routes were announced to be to Africa and the Middle East (Abu Dhabi, Beirut and Cairo). Abu Dhabi will become a key route for the airline due to its close links with Etihad Airways though overall the airline’s own focus will continue to be on Europe, particularly Eastern Europe. Air Serbia will offer most destinations in Africa, the Middle East and Asia virtually through a codeshare with Etihad. Beirut and Cairo will be exceptions as there is sufficient local point-to-point demand for these destinations to sustain a direct service. Through Etihad Airways and the other airlines in which Etihad has equity stakes in, Air Serbia will be able to greatly expand its global network through codeshare agreements, including to Australia. Air Serbia also stands to benefit from receiving traffic onto its own network from codeshare partners. 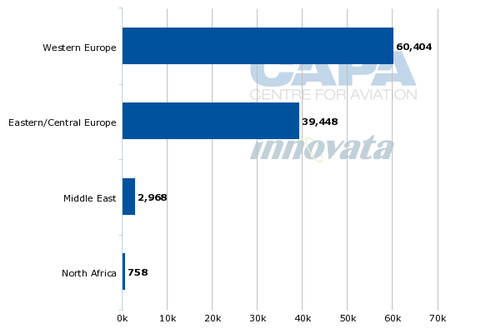 Source: CAPA - Centre for Aviation and Innovata Note: This graph does not include the airline’s twice weekly Belgrade-Monastir service. Note: BEG = Belgrade Nikola Tesla Airport; TIV = Tivat Airport; CDG = Paris Charles de Gaulle Airport; SVO = Moscow Sheremetyevo Airport; TGD = Podgorica Golubovci Airport; ZRH = Zurich Airport; SKP = Skopje Airport; LHR = London Heathrow Airport; DUS = Dusseldorf Airport; VIE = Vienna Airport; AMS = Amsterdam Airport Schiphol. Six of Air Serbia’s top 10 routes (based on weekly seat capacity) are to Western European destinations with the remaining four to Eastern European destinations, reflecting the airline’s overall network capacity allocations with over 50% allocated to Western Europe. 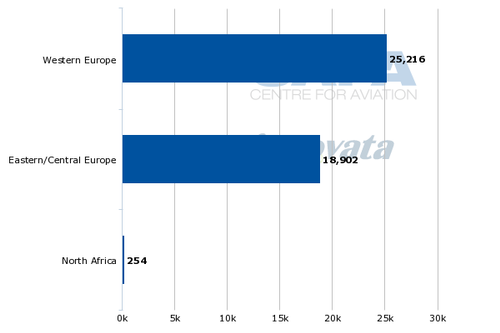 This could change, however, as Air Serbia starts to feed Etihad and other members of the Etihad equity alliance with a focus on providing connections to Eastern Europe. Of the airline’s top 10 routes, Air Serbia currently directly competes with other airlines on five routes and indirectly on two routes. Air Serbia is currently the sole operator of services from Belgrade to Skopje, Dusseldorf and Amsterdam. With a modernised fleet and a revised network including increased codeshare operations, Air Serbia stands a much improved chance of surviving and being able to create a sustainable operation. Despite being a small carrier, Air Serbia will have the opportunity to enjoy an economy of scale that it or other carriers in the region would never be able to achieve on their own. The resource sharing and joint purchasing opportunities and benefits Air Serbia will gain through its partnership with Etihad Airways will also greatly assist the carrier to return to profitability. Meanwhile Etihad Airways and the other members of the Etihad airline equity alliance will see their global reach expand even further with the addition of Air Serbia as the sixth member to the alliance. Overall, if Jat Airways’ transformation into Air Serbia is successful, its long term survival will be more secure and it will be in a stronger position to fend off further expansion by carriers such as low-cost operator Wizz Air, which are continuing to expand their presence in the Eastern European region.